This is it! 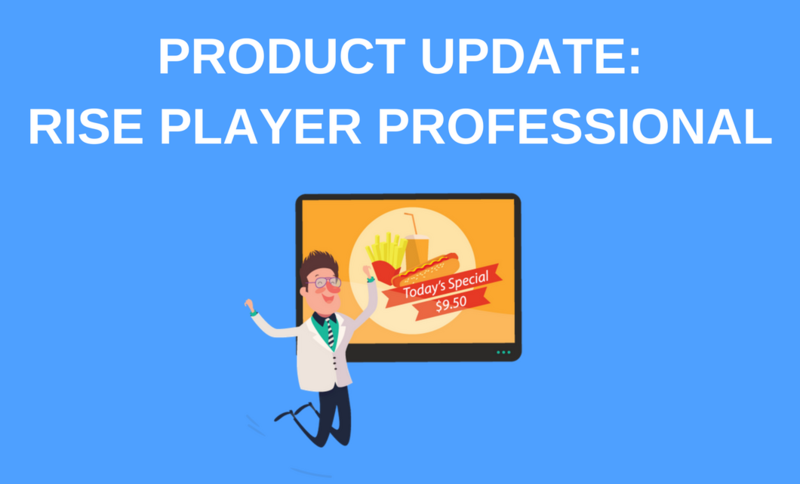 Rise Player Professional has officially been released! For a long time we have heard from our users that they want a more robust and enhanced Rise Player to control their digital signage content. After much consideration, research, and development we are very pleased to announce the first release of our professional digital signage player, aptly named, Rise Player Professional. What is Rise Player Professional? Unlike our existing Rise Player which is a web-based application that relies on an internet connection to start and to show content, the new Rise Player Professional is a self-contained application, which is completely capable of starting and running consistently without an internet connection. How do I upgrade to Rise Player Professional? If you would like to upgrade to Rise Player Professional just select the option from your Display Settings and subscribe on per Display basis for $9 per month, or if you are managing a large network you might consider our Enterprise plan. For one Enterprise subscription all companies within your network are subscribed to Storage, Embedded Presentations, Priority Support and Rise Player Professional. As long as your content has been loaded at least once and assuming the content doesn’t rely on real time data feeds for things like weather or financial market updates, your content will always be shown. What features would you like to see next? This is where you come in! If you are interested in Rise Player Professional and the continuous improvement of the features that it provides please let us know what you think we should add next in this two minute survey. If you don’t need these features we will of course continue to provide our free Rise Player. And if you are not sure if you need Rise Player Professional and would like to try it out, no problem, every Display within your Company can use Rise Player Professional free for 30 days. Simply select Start Trial from any one of your Displays and see what you think.